PDF Fillable Form 12.924 Notice for Trial. Get your free download of our premium fillable PDF form. This is the same form we use in our Documents Preparation Service for our customers. We welcome your comments on how we can improve our forms. Just contact us and tell us your thoughts and suggestions. Generally, the court will have trials (or final hearings) in contested cases. 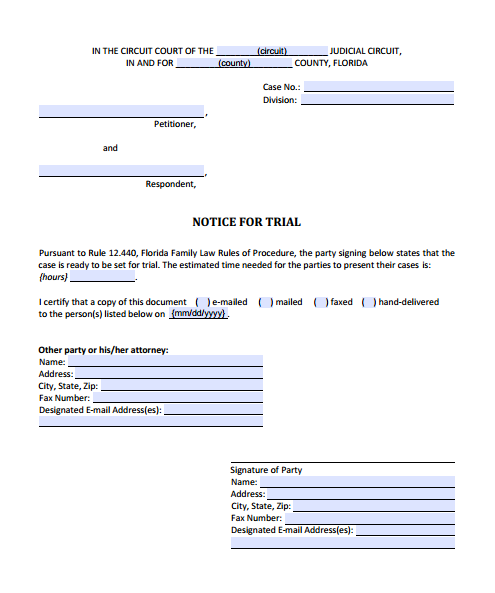 This form is to be used to notify the court that your case is ready to be set for trial. Before setting your case for trial, certain requirements such as completing mandatory disclosure and filing certain papers and having them served on the other party must be met. These requirements vary depending on the type of case and the procedures in your particular circuit.